Air Astana, Kazakhstan’s flag carrier, has taken delivery of its first A320neo at Airbus headquarters in Toulouse in the presence of airline executives and government officials. The aircraft leased from Air Lease Corporation is part of a deal announced at Farnborough Airshow 2015 for 11 A320neo Family aircraft. The A320neo will join Air Astana’s Airbus fleet of 13 A320 Family aircraft, and will be operated on domestic and international network. 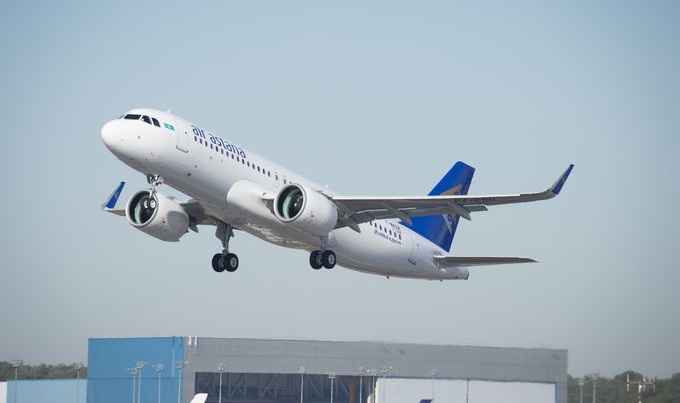 Air Astana’s A320neo is powered by Pratt & Whitney engines and features a two class cabin layout, seating 16 passengers in business and 132 in economy. “We congratulate Air Astana on their first A320neo delivery. Becoming the first operator of the world’s most advanced single-aisle aircraft in the CIS. The airline will not only benefit from the commonality with their existing A320 Family fleet but also from its unprecedented passenger comfort and fuel efficiency “said John Leahy Airbus Chief Operating Officer, Customers. The A320 Family is the world’s best-selling single aisle product line with more than 12,750 orders since launch and more than 7,200 aircraft delivered to more than 300 operators worldwide. The A320neo Family incorporates latest technologies including new generation engines and Sharklet wing tip devices, which together deliver more than 15 percent in fuel savings from day one and 20 percent by 2020.